So after saying that I would wait for the index before diving into the 1940 census, I gave in. On Wednesday, I thought I would just look for my grandfather in Limestone Township, Lycoming County, Pennsylvania. And once I found one record, I wanted them all. After about 45 minutes, I had found all my direct ancestors and I was bored with the 1940 census. Yesterday, I went on FamilySearch to see if they had any new records available. I thought that they might have only been uploading the 1940 census, but I was happy to find an update to the Ohio marriage records. 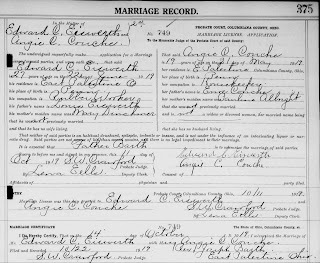 Searching for my great grandparents, I finally found their marriage record in Columbiana County, Ohio. 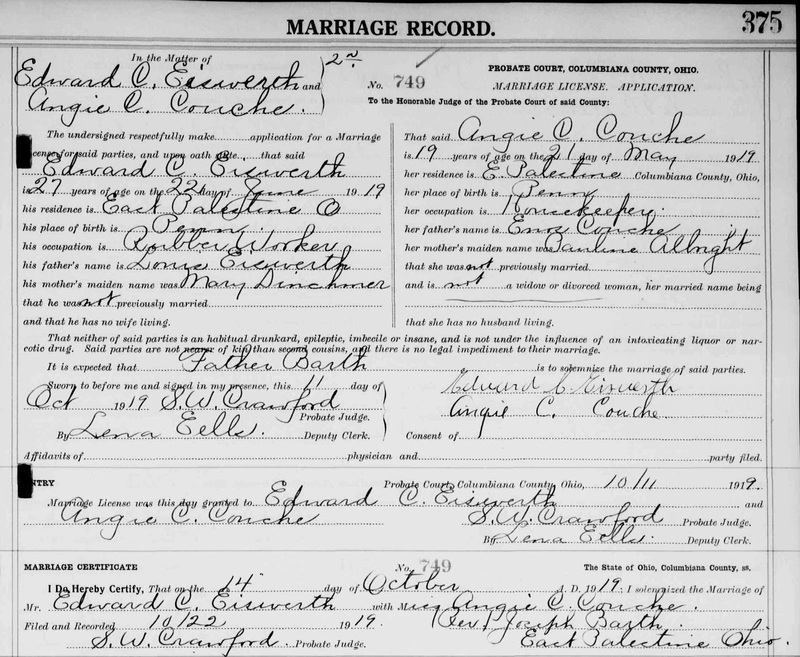 Edward C. Eiswerth and Angie C Couche were married 14 October 1919 in East Palestine, Ohio. My great grandfather was a very serious man by all accounts. He didn't like my great grandmother's first name, Angela, and instead called her Catherine. For the rest of her life she went by Catherine. But before that, she went by Angie. I wonder if her mother called her "Angie" when Catherine would take her son to Cleveland to visit her mother. I wonder how she felt never hearing her name again after moving to my great grandfather's birthplace in central Pennsylvania. I think I'm going to refer to her as Angie for now on; I already call her Angela Catherine. Edward's mother's name is misspelled as Dinchmer. It should be Dincher. Angie also uses the Americanized name for her mother, Pauline Albright. Her first name was Apolonia. I have seen many variations of her maiden name including Albrecht and Albrict.